That is the title of my latest album. Available now in digital download from the sources listed below. The album is a collection of New Age titles, with pop, rock, jazz and electronica influences. Most of the tracks were written for this album. Sheet music adaptations will be available on the website for most titles in the Summer of 2014. The track “Lead Us On” is already available in slightly different instrumentation. The first two tracks have an ethereal, electronic feel with minimal percussion. In Awakening, some of the percussive elements take on a leading role along with the melody and the ‘tinkle’ sound (as an early listener called it). Give Me A Reason has a strong ambient feel with light percussion/rhythm and a memorable melody. Lead Us On is a little more pop in style with some comedic elements in the percussion. I Remember A Rose continues the Pop/New-Age/Electronic hybrid sound with a catchy melody and nice bass part. Don’t Stop Me Now continues with more percussive/rhythmic feel than the early tracks. Waking Me Up returns some ambient feel with a folk-like feel to it. Trying Something Different returns to a more New Age feel, but with a noticeable percussion/rhythm part. It also as a Middle Eastern feel to it. To finish things out, That’s The Way features a trumpet melody with a nice string and bass part to accompany it. I hope you like it. If you do, please comment wherever you heard or purchased the album. I know someone reading this is saying, hold on, another album? Didn’t you just release a Christmas one last October (2013) and an EDM one in Dec 2013? Yes, I did. And I’ve got another one out now and will probably have a couple more out this year (2014). Unlike a lot of artists, I’m not stuck in any one musical style. Maybe I should be, but I’m not. Plus, I’ve never met a woman rich enough for me to want to marry, so my time is pretty much all mine. I spend that time composing, arranging, recording, mixing and releasing albums. This new album is different than the others. You can search for my name on iTunes, Amazon, Spotify, rdio, GooglePlay, Rhapsody, etc. and enter comments there. I’ve had many requests from people I meet for physical CD’s. They either don’t know how downloads work or prefer the physical format. So, I’m in the process of getting all my albums into physical format. For the time being, I’m going with professionally printed and duplicated CD-R rather than the expensive ‘replication’ or ‘glass pressing’ that you might typically buy from a major label. I’ve yet to find any CD player that can’t play them and shelf life isn’t that much different. That is the title of my latest album, available now in digital format and soon in physical format. I’ll have a new entry here that goes into details about that album. In the meanwhile, you can check it out at the link above or listen to it on Spotify. Don’t forget, ALL of our sheet-music is now available at our website for FREE! I’ve uploaded a new video to YouTube. 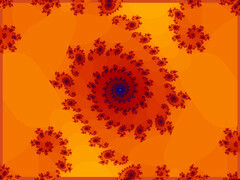 This is another with animated fractals. If anyone has questions about how I do the fractals, leave a comment and I’ll give the details. The background music being used is my own composition. I wrote it specifically for this video. From other videos I’ve seen of similar content, I think what I did with the music is not what one would typically expect. I wanted something different. The music consists of a rhythm track that comes & goes in volume, two pad like tracks, one a bit eerie and finally a video game like lead/melody. I used Reaper DAW to do the mixing. I used the VST instruments Massive (2 different patches), Battery 3 and FM8. There is a lot of repetition. I welcome your comments on the music. As a side note, if you’re looking for some music to listen to, please check out my albums on iTunes, GooglePlay, CD Baby and Amazon. These sites have all 5 albums I’ve released. GooglePlay also has singles not available elsewhere. I didn’t realize I haven’t posted in a while. The summer is a somewhat slow time of the year for posts. Here’s some of the things I’ve been up to. I’ve been trying to post a music video of sorts every couple of days. These consist essentially of still images of my sheet music with an audio recording. The funny thing is that ever since I started posting these videos, YouTube has been pulling the advertisement from the videos and demanding that I offer proof that I own the material in the video. They refuse to answer simple questions like ‘what element of the video do you object to’ and the like. I’m kinda like the guy who builds the best sand castle in the world when nobody (including no cameras) are around. Then someone else challenges them to prove it. How? Everything I post is 100% my material. It has been nearly two months since they’ve pulled the ads from some of my videos. I’ve offered more than enough proof on all the videos, but yet they still don’t put the videos back and they refuse to communicate with me at all – not even form letters. Somebody said that they were going to click on every ad they saw on any YouTube video and any banner ad with graphics served by Google. BUT, under NO circumstance would they ever buy anything they clicked on. Never. They say that will force Google (which owns YouTube) to pay the people hosting the ads but the advertisers would not make a sale and eventually the advertisers would pull their ads. Maybe Google/YouTube would then get the point. Of course, I can’t recommend you do that, but it does sound like a plan. Basically YouTube is interested in catering to the large Media Corporations and show how friendly YouTube is to bigname advertisers. Their latest nonsense is making anyone who doesn’t post videos or comment on videos using their real name feel guilty. It’s too bad YouTube doesn’t care one bit about the users or about small independent artists. I don’t make much from the missing ads, but as a struggling musician, every single penny is important. If you know anyone at YouTube, tell them to quit harassing uploaders and to monetize videos unless they have a compelling reason to believe the video shouldn’t be posted. I’ve made some major changes to my sheet-music catalog. EVERYTHING in the sheet music catalog is free! Just signup using the form on my home page or sheet music catalog page. I am asking for donations. You can donate here. I’d rather see this music used by people than just sit and go unused or hardly used. So, please spread the word and let people know about free sheet music. Our recordings are now sold on iTunes, CDBaby, Rhapsody, Spotify, Amazon and of course GooglePlay. Our recordings are now sold on iTunes, CDBaby, Rhapsody, Spotify, Amazon and of course GooglePlay. I’m no longer selling mp3 files on the website. Although the bulk of my music is available at all the above sites, GooglePlay has titles that are not available anywhere else, so check it out first if you’re looking for our latest. I’ve added several singles this month. Basically GooglePlay will have everything plus singles. The other sites will not have any of the singles. There are now 5 albums available on iTunes and the other sites. I’m still teaching piano lessons in the Micanopy area. I’m easily accessible and not too far from Gainesville, Ocala and the surrounding areas, like Citra and Williston. If you’re looking for a piano teacher and live in the area, consider the short drive to Micanopy for lessons.